SHACHARIT is Temple Shalom's inclusive Jewish educational experience that offers learners the opportunity to engage with Jewish wisdom, wrestle with ideas and assumptions, appreciate the diverse nature of modern Jewish life, connect with Jews in the Temple Shalom community as well as Jews around the world and consider how Judaism will be a part of their lives. SHACHARIT meets on Sunday mornings from 9:30 a.m. - noon and is complimented by a one-hour "Small Group Hebrew" session for students in grades 3-6. SHACHARIT comes from the Hebrew root word Shachar, which means dawn. Our children come to SHACHARIT at the dawn of their Jewish learning experiences. This pilot program for kids in Grades K-1 and an accompanying adult meets 5 times per year and is designed for families new to SHACHARIT who would benefit from a slower and more introductory approach to Jewish education or who need more transition support before enrolling in a weekly drop-off program. Participants enjoy Family T'filah (prayer) followed by activity based learning by grade. Our qualified and enthusiastic educators joyfully guide our youngest students with hands-on activities, music, stories, art, and play. 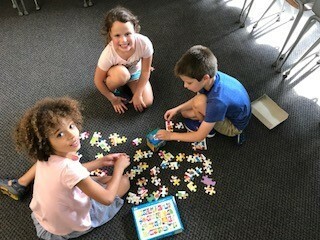 Our 3-5th grade students explore Judaism through three lenses – Torah (Jewish Wisdom) Avodah (Worship and Spirituality) and Gemilut Hasadim (Deeds of Loving Kindness – Jewish Values). Students engage in lively discussions that encourages them to ask questions and make connections between Jewish tradition and history and its application in today’s world. Projects and activites are designed to encourage student choice as they express their understanding with others. Temple Shalom is deeply committed to helping all children in our community receive a meaningful and high quality Jewish education. Our program is supported by our Director of Inclusion and we work regularly with Gateways: Access to Jewish Education to ensure they are caring and well trained as we strive to create an inclusive community. Meet the SHACHARIT Education Team. Learn more about inclusion at Temple Shalom.